A large streamlined yacht is seen on water. Voice from inside yacht: You bought this million-dollar yacht from your annual bonus? Must have been a huge bonus! In the next panel, a man is comfortably seated on an easy chair holding a wineglass in his hand. A woman stands nearby with her hands on her hips. The background shows circular windows with waves showing through, as would be expected from inside a yacht. Man: It was. 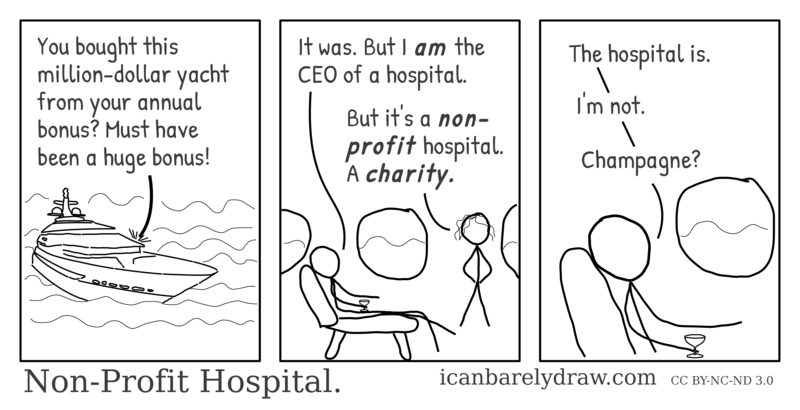 But I am the CEO of a hospital. Woman: But it's a non-profit hospital. A charity. The third and final panel shows only the man in a closer view.